A welcome addition to any meal, Chef Karlin sauces bring flavors to marinades and our Dippin sauces add to any finished meal while our gravy & seasoning products offer the highest quality & value for your store brand choices. If we can be of any assistance, please don’t hesitate to contact us. Ingredients: Enriched Wheat Flour (Wheat Flour, Niacin, Reduced Iron, Thiamine Mononitrate, Riboflavin and Folic Acid), Wheat Starch, Salt, Beef Fat*, Hydrolyzed Corn and Soy Protein, Corn Syrup, Onion Powder, Monosodium Glutamate, Yeast Extract, Caramel Color, Natural Flavor, Spices, Garlic Powder, Disodium Inosinate and Disodium Guanylate. 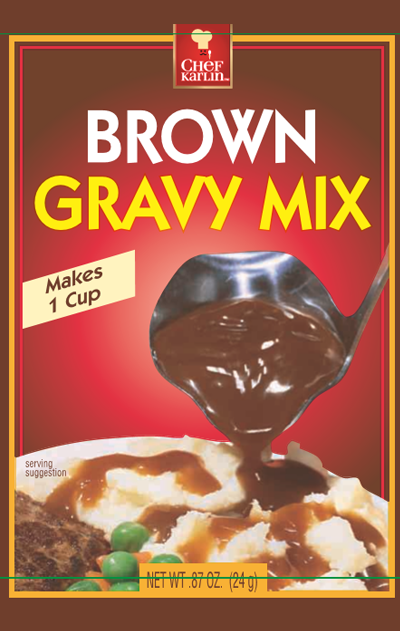 In a small saucepan, empty gravy mix packet. Gradually stir or whisk in 1-cup water. Cook over medium heat, stirring frequently, until gravy comes to a boil. Reduce heat and simmer 1 minute or until thickened.